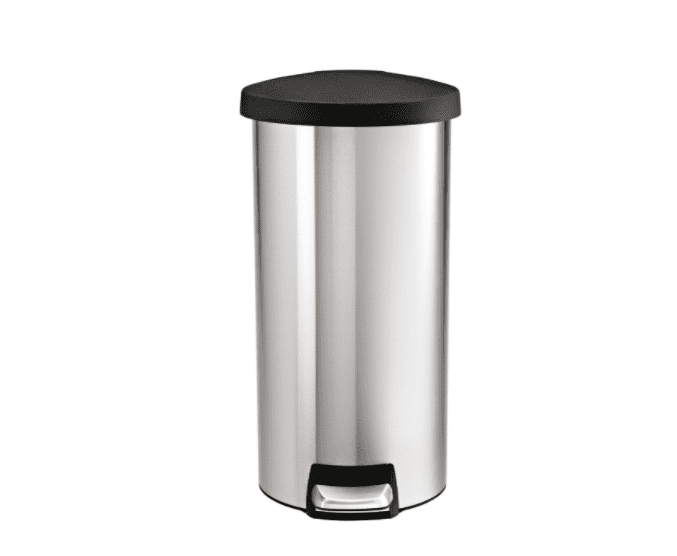 This sleek, round, stainless steel trash can wins the top prize for kitchen trash cans thanks to its durability and design. The dent-proof plastic lid both keeps bugs out and keeps smells in, plus it won’t show fingerprint smudges if you open the can by hand. But you don’t have to lift it by hand at all since there’s a step pedal that is supposed to last up to 150,000 steps (that’s 20 steps a day for 20 years). When the lid closes, it does so quietly thanks to the shocks that cause it to close gently. Bags stay in place thanks to the oversized rim on the edge that grips them tight. It holds eight gallons but the can itself is lightweight at less than six pounds, which makes it easy to move and clean. It comes with a five-year warranty. Customers who have this trash can in their home have been very satisfied with it. Many praise the design, saying it looks great in their kitchens, while others have said that most importantly, they never smell the trash while it’s in there. And thanks to its narrow footprint, one customer said it’s great for even a small kitchen. In terms of negative things, some customers have pointed out that because there’s no inner liner in the can, it’s not ideal for when bags leak. But the majority of those who have reviewed it say that they would recommend it. If you’d prefer a plastic trash can over stainless steel in your kitchen, this one is a great option. It comes in a variety of colors including black, fuchsia, and blue. It’s also slight larger than our top pick, holding the traditional 13 gallons. The strong steel pedal means it won’t wear out as easily as other plastic cans with all plastic components. It also has a side lock that can keep kids and pets from getting into the trash. Customers have been mostly happy with the purchase of this can, with many praising the slow motion lid that shuts quietly. A few have complained about parts breaking on the trash can such as the pedal, but overall, the majority of people have reported being highly satisfied. Need a small trash can for your bathroom? This one from simplehuman is great because of its pleasing appearance and functionality. Made of brushed stainless steel, it features a strong steel pedal and a fingerprint-proof surface. There’s also a removable inner liner that catches leaks and lets you take out the trash easily. The trash can comes with a 10-year warranty, and custom-fit plastic bags are available if you’d like to use them. As a top-selling trash can in its category, the product has received great reviews from customers who have purchased it. Many have praised its sleek look and the fact that it contains odors when the lid is closed. Some have mentioned that there are issues with the step pedal—one mentioned that it can tip if it’s used while the trash can is on carpet. But overall, users have been satisfied with their purchase. It is also available in a polished stainless steel, white, or bronze finish. If you’d rather have a bathroom trash can without a lid, this sleek design is a great option. The oval can is made from durable polypropylene and available in nine different colors including red, mist blue, silver, bronze, and white. It can hold two gallons of trash and has a handles for easy carrying. Those who have purchased this product have been very satisfied with its value and design. In terms of critical reviews, some have said that they’ve had issues with the plastic breaking. But most would agree that it’s a great product and would recommend it to others. Don’t want to spend a lot on a trash can? There are definitely budget options out there. This one, in particular, is a great deal. Still sturdy and durable, it’s a fraction of the cost of most cans that hold the same amount of refuse (13-gallons, to be exact.) You'll be able to open this with the touch of the hand while the trash bag is hidden with its unique seal making it easier on the eyes. The majority of customers were very pleased with their purchase for the price and love how it keeps odors in and pets, children and household pests out. When it comes to an office, you don’t need a trash can that will contain smells or deal with garbage that might leak. This wire mesh trash can looks great in an office environment and can hold up to 4 ½ gallons of waste. As part of the Rolodex mesh line, you can also get matching office accessories such as pencil holders, paper organizers, and laptop holders. Many who have purchased it have praised its design and efficiency. One even mentioned it being so nice looking that they didn’t want to line it with a plastic bag. While most people say that it’s durable and sturdy, a few experienced some dents in the product when it arrived. But overall, the majority of users would recommend to others. If you need a trash can for your office, bedroom, powder room or other space but don't want to sacrifice style, this option from B&C Home Goods is a great pick. This small trash can is 10 inches by 10 inches and is made from natural sea grass that has been dyed by hand. Reviewers love how this trash can blends seamlessly in with their room decor rather than standing out like an eye sore. The woven design is neutral enough to match a variety of decor styles. Whether you use a small trash bag or liner in this can or use it bare, it will last a long time thanks to its durability factor. If you’re into smart home gadgets and want even your trash can to be high tech, this 21-gallon bin might just be for you. The lid of the can is operated by three D batteries, and has a motion sensor that opens the lid when you wave your hand in front of it. The lid will then remain open for three seconds after you’ve tossed your trash and moved your hand away. Add to the high tech factor that this can is made of sleek, brushed stainless steel, and you have a winner for modern homes. Customers love the size of the bin and the fact the bag doesn’t show when the lid is closed. One reviewer does warn, however, that the trash can went a little berserk about seven months into its life by just opening and closing the lid automatically at random times. Another said that the lid will sometimes open when someone walks past it and triggers the sensor. Those technical difficulties certainly aren’t standard, but important to be aware of. 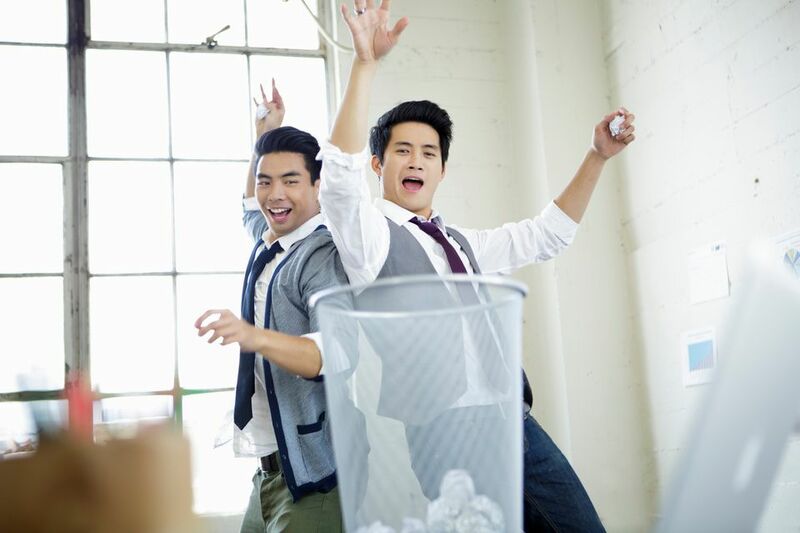 Can a trash can be beautiful? Judging by this simplehuman model, the answer is a resounding yes. This rectangular model has gently rounded edges and comes in four luxurious, smudge-resistant finishes: dark bronze, stainless steel, white steel and even rose gold. While there are no fancy automatic sensors on this trash can, reviewers say it’s still worth the premium because the design works so well. An integrated pocket keeps bags where you need them, and the can’s stainless steel liner keeps bags secure and out of sight. Other features include an integrated drip guard and a wide, sturdy steel pedal that owners love, saying it opens the lid easily and quietly. Though most feedback is quite positive, some reviewers dislike the room that the bag pocket takes up, especially if they decide not to use simplehuman’s special trash-can liners; a few also say the steel dents too easily during shipping. This trash can comes in three capacities: 30, 45 or 55 liters, making it a great choice for households of any size. The 55-liter model is roughly 14 by 18.5 by 26 inches. It’s backed by a generous 10-year warranty.